Anyone who looks into alternative religions or comparative forms of spirituality will quickly discover the existence of Theosophy. Those individuals who enjoy a critical and discerning intellect will recognize the appeal of Theosophy almost instantly. Combine this enquiring mind with a love of reading and you have yourself a student of Theosophy. This interest by itself still cant turn someone into an actual Theosophist. People who become truly involved in Theosophy, all start from a common foundation, with a “spiritual calling” that is felt and deeply understood as a desire to become a better human being in order to be able to serve the cause of a better humanity and bring about an improved culture. This unselfish and powerful spiritual longing, for a higher and better way of life, for everyone, is the very essence of altruism. This spiritual longing which is so deeply felt and profoundly understood causes the realization that there is a higher life already existing but unrealized within the individual. In Theosophy we call this preexisting and innate higher life within the individual the Higher Self. The Higher Self has imprinted its qualities deep into the lower self particularly into the energy and emotional bodies. The reflection of the higher mind into the lower mind determines the lower minds capacity to organize itself and think independent thoughts. Theosophy is not a path of ‘self improvement’ it makes no claims whatsoever about improving ones romantic, financial or social status, neither does it advocate acquiring power over others by hidden means, indeed it explicitly forbids this. So if Theosophy is not a path of ‘self improvement’ what then is it? Theosophy is a path of ever deepening Self understanding, and Self realization reflected in the world and life as it really and truly is. The Theosophist is a “truth knower” and this is clearly stated in the Motto of its Society. “There is no Religion or Law higher than Truth”. Theosophist accept nothing on face value. Yet all Theosophists trust the “spiritual calling” from their higher Self, and respond to it with gratitude and love filled devotion. They combine this devotion with an ever developing understanding of the spiritual laws that govern the Cosmos. Theosophy is also called “the heart doctrine”. The awakening imprints of the higher Self in the Four ‘lower’ principles requires only that those tendencies which can obscure and obstruct awakening into the higher Self be removed by the central practices of active and engaged Theosophy itself. A chaotic and confused life is replaced by one of inner integration and integrity. Unity of Self and true Individuality emerges naturally. What is the source of this unity and Individuality? The pure and simple answer to this deep question is “The Logos”. 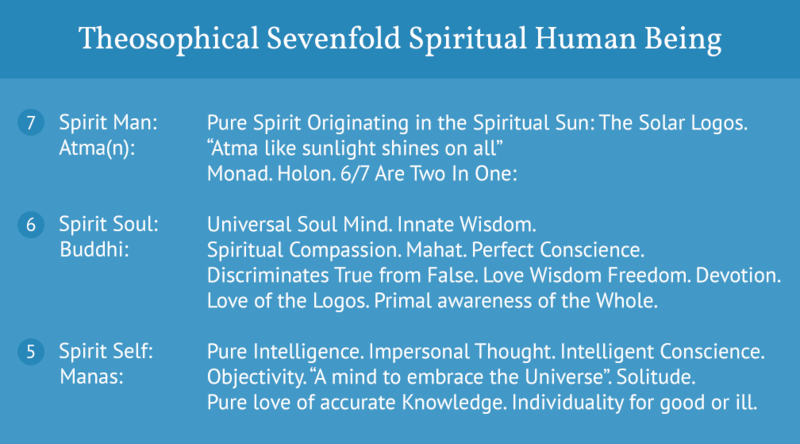 In Theosophy the Logos is very,very, important. The Higher Self is fully integrated into it and indeed arises into life from it. An important distinction must be made here when we say “Integrated into the Logos” we are specifically and clearly not saying “Assimilated into the Logos”. The Higher Self remains a true and Free Individual in the deepest sense for all eternity. Every human being is a free and individual logos in their own right. Anyone familiar with Christian theology will immediately recognize the almost exact similarity to the deeper teachings of Christianity and in particular the teachings of the Roman Catholic Church and the other Christian denominations. If the similarity is almost exact, what then is the difference? The Higher Self in we human beings is Integrated within and born out of the Third Logos. It is our inner god though we ourselves are not gods, at least not yet. Theosophy also differs from organized Exoteric Christianity in an other important respect; theosophists reject all together the notion of vicarious atonement, Jesus did not die for your sins. You are responsible for your ‘sins’. There is accountability in the Cosmos and you a reincarnating Higher Self under the law of Karma like every other individualized being, must win your own godhood in the “cycle of necessity”.